Contrary to popular belief, cats do not need friends! As a solitary species they are more than happy to live alone. Many cats that live with others under the same roof would prefer not to and only tolerate the presence of others to gain access to the things they need such as food, water and litter trays. 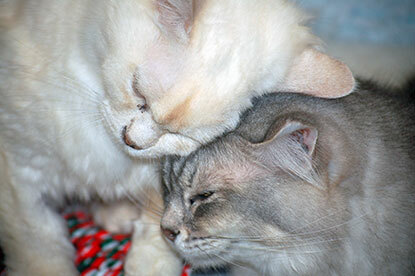 For many, close proximity to other cats can be extremely stressful and this stress can be difficult to spot. There are some cats that do like each other. Cats which sleep touching and spend time grooming or rubbing against each other are likely to be in the same ‘social group’ or ‘friends’. The resources below discuss how to tell whether or not your cats belong to the same social group, as well as advice on steps to take if all is not harmonious in your home. 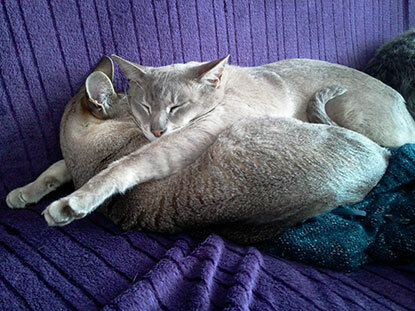 In this behaviour focus post, Cats Protection Behaviour Manager Nicky Trevorrow explains why two cats may not get along and how to gradually introduce them to one another. In this behaviour focus post, Cats Protection Behaviour Manager Nicky Trevorrow explains how to recognise feline social groups. So you've just got a new dog and you want to introduce them to your cat. When introducing any new pets to each other, it’s much better to control the situation rather than leave the animals to sort it out for themselves. Contrary to belief, cats and dogs can get along if introduced appropriately. 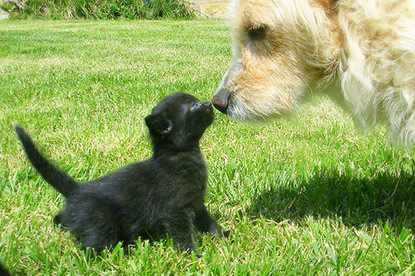 A gradual introduction can make all the difference and it can be easier if the cat had positive experiences with dogs when it was young and vice versa. This is likely to depend on the character and previous experiences of both animals. If you have a cat that has previously lived happily with a dog, they are likely to accept a new one more easily than those that have either not seen dogs before - or been chased by them! Equally, dogs that have lived calmly with a cat are generally easiet to introduce to a new cat than those that haven't had any interaction with cats at all. When it comes to intergrating cats and dogs, the process needs to be slow and careful to make sure both the cat and dog are not stressed and that chasing and running responses do not become established. 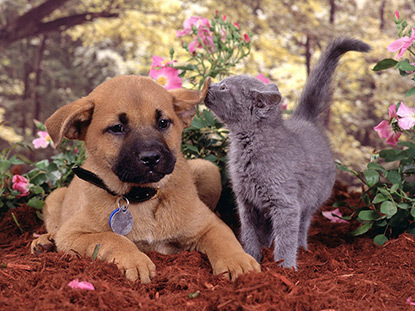 The easiest time to intergrate dogs and cats is during their 'socialisation period' (up to eight weeks of age in cats and 12 weeks in dogs), during which time puppies and kittens will accept the presence of the other individual as normal.